A pure free market economy is great on paper. Goods and services are exchanged under conditions mutually agreed upon by the seller and the buyer. The efficiency of the system is enforced by the natural laws of supply and demand, leading to lower pricing and increased quality of service. Under this theory, government regulation is an evil which distorts the market and dilutes the purity of the relationship between the consumer and producer. As we’ve been reminded recently, a free market economy also has its downside. In hindsight, lending money to low-income home owners with “teaser rates” that triple 18 months into the contract maybe wasn’t the greatest idea. Yes, the homeowners signed the contract without “coercion”, and yes sub-prime loans generated handsome short term profits for the financial institutions that offered them. But sub-prime loans were a pyramid scheme that could only work as long as house prices kept rising. As always, there are ways to profit from extreme volatility, but a global recession is not what the doctor ordered. I expect my government to build roads, hire school teachers and police the streets. If they also take it upon themselves to keep an eye on the banking industry, that’s fine with me. I trust most people to do the right thing most of the time. But corporations are genetically programmed to increase their quarterly earnings. Make the number. Beat The Street. It’s embedded in every corporate charter to maximize profits for shareholders. Blaming corporations for acting irresponsibly is like blaming a cat for chasing a mouse. They can’t help themselves. And we shouldn’t expect them to. With Barrack Obama set to become President and the U.S. economy on the skids, it appears the American public is developing an appetite for increased regulation. Disagree with it or not, more regulation is coming. And if you don’t get out of the way, your portfolio could get trampled. The perfect example of this is the recent regulatory changes to the $3.4 billion payday loan industry, which advances cash to strapped workers – charging them 400% annual interest. Like the sub-prime loans and credit cards, payday loans are a service that no-one is forced to use. But earlier this year the democratically controlled Congress passed a 36% Pay Day Loan interest cap in 15 states plus the District of Columbia. Is it bad? You decide. Before you do, consider the facts: 99% of payday loans go to repeat borrowers. Low income African-American neighbourhoods have 3 times as many payday stores per capita as low income white neighborhoods. Military bases also attract a high number of payday loan shops. The average borrower pays $500 interest on a $325 loan. Payday loans – which are marketed as a service for financial emergencies – are often converted into long-term, revolving, extremely high-cost debt for working families. Not surprisingly, the payday loan industry was less than thrilled at Congress’ intervention. They spent $30 million initiating and promoting a ballot in Ohio and Arizona to overturn the interest rate cap. Opposing grass-roots campaigners spent $475,000 to thwart them. In the end the payday loan industry lost in Ohio by a 2 to 1 margin and in Arizona by a 3 to 2 margin on Election Day last week. The result of the legislation and overwhelming backing by the voting public hasn’t been good for payday loan companies (foolishly pitched as “recession-proof” industries). For instance, shares of Advance America (NYSE: AEA), which owns 2,800 cash advance centers, have declined 35% since the ballot result. Cash America (NYSE: CSH) shares are off 20% in the last five days. EZCorp (NASDAQ: EZPW) is also down. 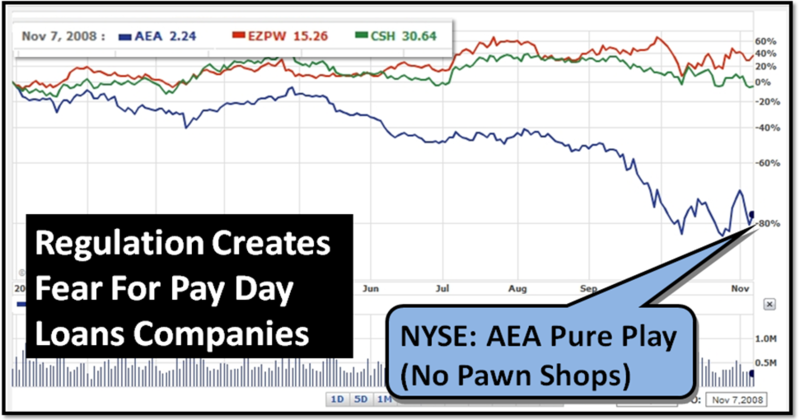 However, EZCorp and Cash America own hundreds of pawnshops which has blunted the stock price impact of the new Congressional regulation. I consider my greed level to be about average. I own stocks in sectors with dodgy environmental and labour histories, so I’m not preaching. But for my own peace of mind, I try to steer clear of companies whose primary business objectives are almost guaranteed to bring misery to its customers. Charging 400% interest to financially-strapped military families is outside my comfort zone. At Q1 Publishing we believe that it is vitally important to keep an eye on politics and regulatory legislation that affect the financial industry. Notions of a “free market economy” will be different under Obama and regulation is going to be hitting a lot of industries. The payday loan industry is just the tip of the iceberg. In the meantime, there is a historically proven conservative investing strategy that will help you to rebuild your portfolio. The writer has NO positions, long or short, in the stocks mentioned in this article. I’m glad Ohio voters saw through the lies and deceptive advertisements of the payday lending industry and voted overwhelmingly to pass issue 5! This is a very positive development for Ohio’s families, particularly those who were caught in the never-ending cycle of payday lending debt. Ohioans realized that payday lending is a defective and predatory product designed to trap people in debt. Voters strongly repudiated over a decade of predatory payday lending! This is a great victory for Ohio’s consumers! Payday lending is not predatory lending……if anything is predatory lending it's going to be these credit cards companies that give people with bad credit, credit cards!!!!. They are the predators.